Thank you for shopping with The English Truffle Company. If you are not entirely satisfied with your purchase, we're here to help. Your item must be unused / unopened and in the same condition that you received it. On preserved food items (oil, salt, truffle gifts) they must be unopened and have the security seals intact. Once we receive your item, we will inspect it, notify you that we have received it and inform you on the status of your refund. You will be responsible for paying for your own shipping costs for returning your item. Shipping costs are non-​refundable. Please note some items should be sent to a different address. Please contact us BEFORE returning anything. 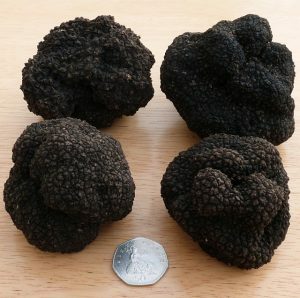 Truffles - We carefully inspect our truffles before we send them to you. Occasionally, they may not be of the high standards you expect. If this is the case, please get in touch. Trees - You have 7 days to return them. They are sent to a different address. Please contact us.